Over at FASHIONetc.com, they are asking for some new cosmetics based on some of the most popular cartoon characters - like Jem, The Chipettes, and Jessica Rabbit! 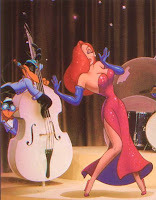 With the female Disney Villains, Tinker Bell, Barbie, and Wonder Woman having their own line of inspired make-up and accessories, could a Jessica Rabbit line be too much of a stretch. Some must-haves include eye liner, purple eyeshadow, and bright red lipstick.